Join us for the annual SBCC family holiday party! Lunch, games, crafts, and a visit from Santa and Mrs. Claus are all part of the fun. Gifts for children 18 and under will be delivered by Santa. If you would like to bring a wrapped gift for siblings, Santa will distribute them at the same time. Please bring a festive snack or dessert to share. 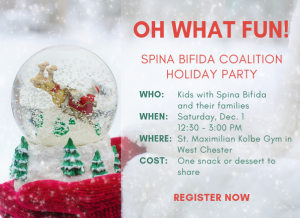 Gift suggestions (approximately $25) for your child with spina bifida should be sent to dburns@sbccincy.org. Be sure to include the child’s first and last name, parent’s last name if different than child, gender and age. Santa’s elves will do the best they can to meet your request.